[Discontinued] I hate to admit it, but now and then, I pick up a flavor to try and it doesn't get eaten for several weeks. Such is the case with this container of Edy's frozen yogurt. I was trying to be adventurous, but after trying several other tart yogurts, I inadvertently burnt myself out. Well, I decided it was time to see how badly freezer burnt my little friend was about 20 minutes before dinner. I figured I'd just do a simple scoop review and probably toss it in the trash. Well, to my surprise, not only was it still in good shape, but I like it! Holy freholy I found another frozen yogurt I like. Sure, it's got that typical Edy's rubbery thing going on, but I like it, it's nice and sweet. Ahhh, plain and simple, none of that tart stuff. Somebody else can review the tart stuff, I'm staying over here with my buddies Edy and Ben & Jerry. As you may have guessed, I aimed right for that tasty looking swirl in the front there. The swirl is mild in regards to sweetness and taste, it's definitely not too potent. The yogurt is just a simple vanilla flavor. There are there crunchy bits, though they aren't really crunchy (but they have been in my freezer awhile). Overall, a decent treat that will make you are thinking ice cream, not yogurt. The downside is the rubbery nature of the beast which is a shame. It just doesn't have that clean all natural feel that a B&J or Haagen-Dazs would have, and I think I was hit by a little bit of an aftertaste ...but you are also paying a lot less for Edy's ( Dreyer's ), and still getting a fairly healthy treat. Once I get through this one, I'll definitely have to try some of the other flavors. On Second Scoop: Ok, the initial excitement has worn off, and as always, I'm already started to get frustrated with the chewy nature of Edy's products. The vanilla base ain't bad, the granola bits are well, a bit annoying, and the fruit swirl isn't as pleasant as I remember. 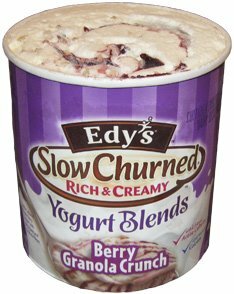 Oh well, it's still decent, but it seems to happen every time (I still want to try another Edy's froyo flavor). On Third Scoop: I finished off the last bit of the froyo last night and I just wanted to say I was a bit harsh with my second scoop. This really is a decent product, even if it is a little chewy at times. Mrs. Dubba is becoming the household froyo expert and she definitely enjoyed it as well.